A student project that uses telecommunications technology to speed up the detection of dengue cases won the grand prize in last Wednesday’s 7th Smart Wireless Engineering and Education Program (Sweep) Innovation and Excellence Awards in the SMX Convention Center at the SM Mall of Asia. The student team from Bulacan State University (BSU) automated and sped up the detection of dengue through blood platelet counting using a portable capturing device that connected via mobile Internet to a digital analyzer machine. The project, 3D: Dengue Detecting Device, won P500,000 in cash through Smart Money for the student team led by Donn Angelo Teodoro and another P500,000 in grants for the school. Holy Cross of Davao College, meanwhile, got 2nd place for its system that automatically alerts maritime authorities in cases of overloading of vessels. The system uses sensors to detect overloading of ships and then automatically warns authorities through text messages. The student team led by Bobby Jay Carmelotes won P300,000 in cash through Smart Money and another P300,000 in grants for their school. Third place went to Batangas State University for its drip irrigation system that used GSM technology and various sensors. 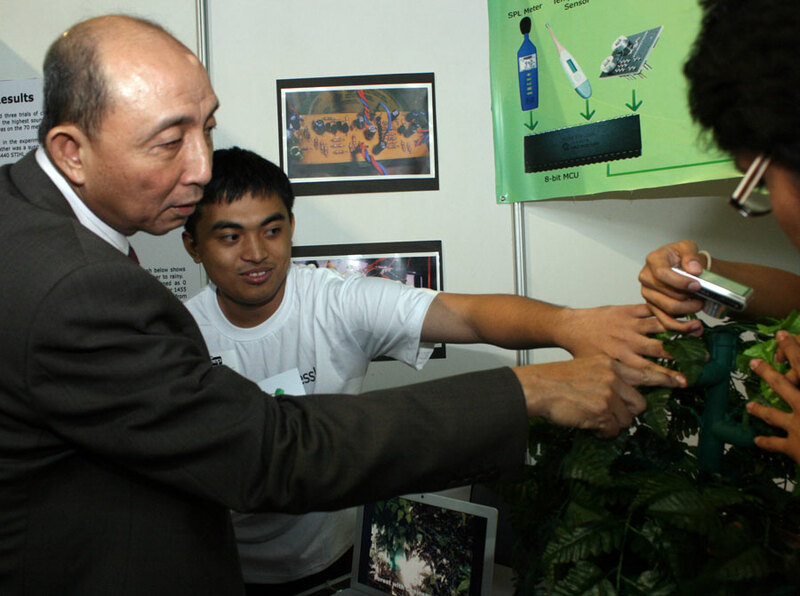 The Smart Farmbihira system is capable of automatically watering and fertilizing a plantation at a set time or manually through a text message. The system also notifies the farmer on the condition of the soil and the harvest time of the crop. With the win, the student team led by Josephine Medina got P150,000 in cash through Smart Money while the school won P150,000 in grants. The three winning projects bested seven other entries from Smart’s partner schools all over the country. I attended the Cebu launch last May 24 of ümobile, the first advertising-funded mobile phone network in the country, and boy was it the loudest telecoms-related launch I’ve ever covered. It was the sexiest, too. The launching was held in Club Vudu and by the time it ended, I knew more about what “Vudulicious” was than the details of ümobile that I had wanted to find out during the launch. 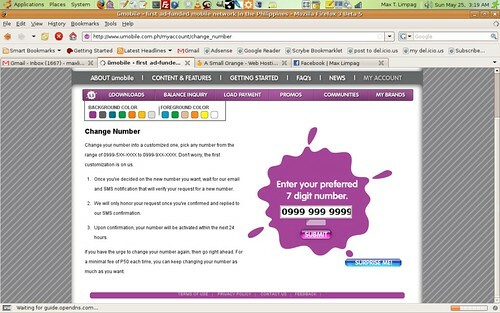 CHANGING YOUR MOBILE NUMBER. Ümobile allows its subscribers to change their mobile numbers by themselves in the company’s website. The first change of numbers is free, succeeding ones will be charged P50. Click on photo to view larger image. The time indicated in the invitation—9 p.m.—and the venue told me it was going to be a launch party, with emphasis on the “party.” I was there at 9 p.m. and found Club Vudu still deserted but for ümobile staff doing last minute preparations. I asked one of them whether they would be holding a press briefing and was told none was scheduled. She did say one ümobile official would look for me later and answer my questions. Fast forward one hour and a half. UMOBILE PARTY. Vudulicious in Club Vudu. The umobile launch was the loudest telecoms-related launch I’ve ever attended. Click on photo to view an even larger image. I finally got my Asus Eee PC last Wednesday. It has, since then, replaced my main writing gear: an MSI S260 laptop running on Ubuntu Linux. Several reporters and editors in Sun.Star Cebu had wanted to purchase an Eee PC since the start of the year but we couldn’t get a supplier with enough stocks to provide the initial 10 purchases. Cebu shops, I was told repeatedly, had waiting lists for purchases. TRULY MOBILE OFFICE. 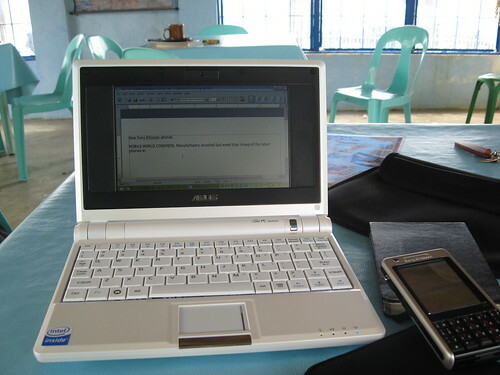 Trying to beat a column deadline using the Asus Eee PC in a beachsite resort in Argao. These are my mobile work tools: the Asus Eee PC, a Moleskine reporter’s notebook, and a Sony Ericsson P1i. Click on photo to enlarge. The two boxes of Asus Eee PC arrived at the office last Wednesday. We got the 4G model. I chose the pearl white version but at the back of my mind, I was still thinking of the Lush Green version of the 2G model. For such a small device, the Asus Eee PC packs a formidable arsenal: Wi-Fi and Ethernet connectivity, 3 USB ports, a built-in webcam (4G and 8G models), a VGA port for external displays, built-in stereo speakers and a microphone, and a built-in MMC/SD card reader. Any more feature and it could probably write a story for you. But it’s best feature, I think, is that it runs on Linux. It was a picture of domestic bliss-a couple taking their child to a picnic in a public park in Cebu. The pair was laughing and appeared to enjoy an afternoon away from the demands of work and pressure of urban life. The problem was the man wasn’t having a picnic with his legal family, he was spending time with his mistress. When his wife saw the photo in Sun.Star she had a heart attack (she’s okay or so the man says). The man called up the photographer to ask why he printed it when it was “obvious” that the woman was too young to be his wife. He also said he and his mistress had been able to hide the affair from the wife for so long “pwerte namong tago ani” (we really tried to keep this a secret). One municipal government’s website in Visayas is being maintained by its meat inspector. Frederick Amores, Visayas group head of the National Computer Center (NCC) Field Operations Office, could barely contain his laughter as he said this in an interview. The NCC was conducting a seminar for IT workers of local government units (LGUs) and Amores was checking the background of the participants when he saw the meat inspector’s bio-data. Manuel L. Quezon III is among the country’s top political bloggers. He describes himself as a “prototypical pajama blogger” working and blogging from home. During the House of Representatives’ vote on the committee reports dismissing the impeachment complaints against Arroyo, Manolo covered the proceedings from late afternoon until 4:00 a.m. when he collapsed in exhaustion. Below are transcripts of my email interview with Manolo for the “See it, hear it, blog it” article for Sun.Star Cebu during the Cebu Press Freedom Week. Max: Professor Jay Rosen of the New York University said early this year that the question of bloggers vs. journalists is over. He says the “question now isn’t whether blogs can be journalism. They can be, sometimes. It isn’t whether bloggers “are” journalists. They apparently are, sometimes.” Do you agree with his statement? Do you see yourself as journalists in the mold of reporters producing original news content or more of opinion writers who comment on news items? Manolo: In my particular case, I have always been an opinion writer (either as a columnist or editorial writer), or have delved into history. Whether history (examples would be my pieces on Edsa One or say, the American period) or reportage (reportage, to me, is a kind of literary form of the essay, I’ve been influenced in this view by Ryzsard Kapuzsinsky, by Tom Wolfe, Nick Joaquin, etc. ), or opinion-writing, which includes both analysis and commentary (analysis is putting together events and circumstances to come up with an educated guess of future trends, or a prognosis on ongoing events; commentary is a synthesis of personal views and that of other people on a specific person or event). I brought Lennon to work last Sunday. He wouldn’t let go of his mother just as we were leaving for work so we had to bring him with us. His older brother, who says he cannot sleep without him at his side and vice versa, agreed when we explained we couldn’t take him with us because he had to wake up early the next day to make it to class on time. The newsroom is a child-friendly environment to work in. Editors and reporters, at times, take their kids to work, especially during weekends. The newsroom also schedules an annual party for its employee’s children.